Lazio, Latin Latium, also sometimes used in English), is a region of central Italy, bordered by Tuscany, Umbria, and Marche to the north, Abruzzo to the east, Campania to the south, and the Tyrrhenian Sea to the west. The Farmhouse Sant'Angelo is a beautiful and enchanting place where you can spend a fascinating country holiday. It invites you as a guest and you leave as a friend. The charming old Farmhouse is located on a green hillside and it has a splendid panoramic position, which dominates the whole valley. It is placed on the Monte Rufeno Natural Park Reserve, an uncontaminated land where people can live in direct contact with nature. The charming old Farmhouse is located on a green hillside and it has a splendid panoramic position, which dominates the whole valley. It is placed on the Monte Rufeno Natural Park Reserve, an uncontaminated land where people can live in direct contact with nature. The accommodation comprises: 1 double room leading out on to the garden at the back of the property, a room with two single beds and with a double bed at mezzanine level. There is also a kitchen/dining room with TV and a bathroom with bath/shower. Apartment in Sezze, little medieval town: In no time at the beach, in no time in the mountains and in no time in Rome! Even without car itll be easy to go and visit Rome(50 min. by train), Naples (120 min.by train), the seaside and many historical villages on the mountains. All services like supermarket, restaurant, pizzabar, bus stop etc. within 100 metres! Real Italian live. No tourists. The climate is warm and dry in summer and not too cold during the winter. Centre of Latina 20 km. The ppartment is 120 square metres with all most important facilities. Towels, linen, sheets, final cleaning, energy & water costs all included in weekly price. Automatic gate. Sleeps 6. Villa Conchetta is comprised of 2 mirror Villas one of which is available for rent "La Villa" and an independent house "La Cascina". These houses are situated on a `2 hectare property and overlook a picturesque hilly scenario typical of the northern Rome countryside where sheep and horse grazing are a familiar site. All houses surround an interior courtyard with orange and lemon trees, and a wading pool. A 120mt (350ft) long road entrance, surrounded by olive trees, leads to the villa. "The location on the hill provides a pleasant cool breeze on warm summer days". Villa Conchetta, surrounded by olive trees and built in a quaint Lazium-Tuscan style, consists of handmade terracotta floor tiles, stucco exterior walls with a typical antique Roman red finish and chestnut wooden ceiling beams with intermediate terracotta tiles. The roof is of early century terracotta coned tiles. Sleeps 8. 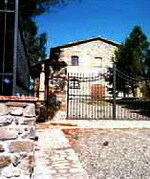 Beautiful Countryside Villa rental minutes from Rome, Lazio and minutes from Lake Bracciano and historic surroundings. "La Cascina" is situated on a `2 hectare property and overlook a picturesque hilly scenario typical of the northern Rome countryside where sheep and horse grazing are a familiar site. La Cascina surrounds an interior courtyard with orange and lemon trees, and a wading pool. A 120mt (350ft) long road entrance, surrounded by olive trees, leads to the villa. "The location on the hill provides a pleasant cool breeze on warm summer days". La Cascina, surrounded by olive trees and built in a quaint Lazium-Tuscan style, consists of handmade terracotta floor tiles, stucco exterior walls with a typical antique Roman red finish and chestnut wooden ceiling beams with intermediate terracotta tiles. The roof is of early century terracotta coned tiles. Sleeps 3.